Text messaging is arguably the future of business communication. A study conducted by Nielson predicts that over 96 percent of Americans under 44 years old have a phone, and according to a MobileMarketing study, upwards of 95 percent of text messages are read within two minutes. 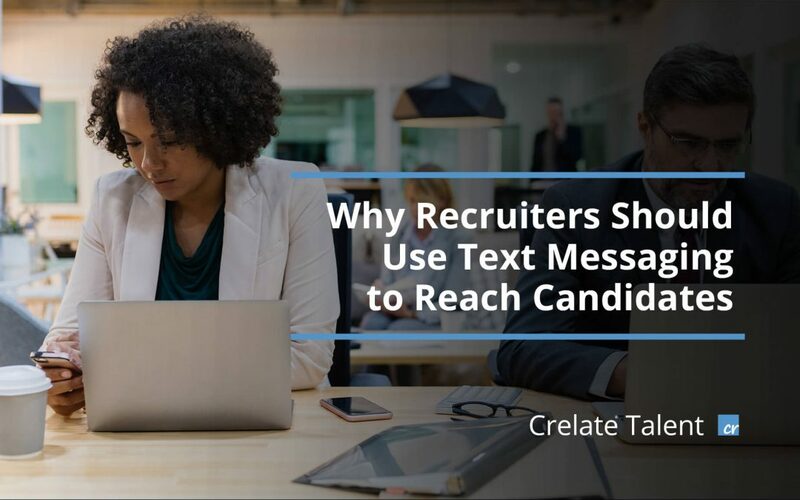 So it makes sense that recruiters use text messaging to connect with candidates. It’s especially useful for eliminating the back and forth of scheduling interviews and delivering time-sensitive information. But there’s a bit more to engaging candidates via text message than being professional and polite. As you know, recruiters also have to maintain compliance and manage their candidate relationships over time. Here are a few things you’ll need to consider when using text messaging in your recruitment efforts. Recruiters already have plenty of compliance standards to contend with. Unfortunately, texting adds another layer of compliance. However, the rules are easy to follow. The Federal Communications Commission (FCC) regulates the Telephone Consumer Protection Act (TCPA) which requires that you must get consent to contact someone’s phone number before you text them. Ideally, you should ask them via email. That way you have a written record of that consent. Additionally, you must also provide text recipients with a way to opt out of future texts. To meet this requirement, you can include a line at the end of your text about how recipients can ask you to stop texting them. TCPA compliance is important, since fines range from $500 to $1500 per call. So the bill can add up fast. Even if text messaging is a fairly immediate form of communication, you may go for a week, or even months, without talking to a candidate or client contact in your network. Then, if and when you’ve cleaned out your inbox, your information remains in Crelate’s ATS database for engagement tracking and automated recruiting workflows to re-engage your disengaged candidates and clients. Text messaging is important for quick and succinct communication. It can be easily automated for repeating processes and you can build a library of template messages to maintain a consistent tone and candidate experience. A great applicant tracking software will allow you to store and share personalized text templates that save time when sending generic messages. Ideally, your ATS and recruiting CRM solution will have a text messaging integration to help you standardize your texting, maintain compliance, and track conversations you’ve had with each candidate or client. Otherwise you risk spending a lot of time updating your ATS based on candidate conversations that take place outside of your recruiting software. Crelate’s Talent Management solution has a text messaging integration available for purchase within the app settings. Text messages can be sent anywhere from Crelate, whether it’s your chosen web browser, or through the Crelate Connector app on an iOS and Android mobile device. All text messages are recorded and attached to the respective contact so you have a conversation log for reference. Additionally, you can create text templates to maintain compliance, standardize your text conversations, reduce unconscious bias, and automate the texting process as much as possible. Text Messaging by Crelate also offers unique telephone numbers so you can send text messages without using your personal phone number for increased privacy. Lastly, the Crelate interface is entirely browser-based and supported by the Crelate Connector mobile app. No additional software or integration widgets are needed. So, if your ATS and recruiting CRM software doesn’t have any sort of text messaging integration, it’s probably causing you a lot of extra work that could lead to future issues. Schedule a demo to see how Crelate can improve your candidate engagement with text messaging.